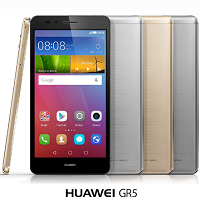 The Huawei GR5 is good phone to have for an active lifestyle. The 1.5 GHz ocatocre processor gets things done, and the 2GB RAM makes sure you can multitask properly. Capture life’s moments with the 13MP rear camera and the 5MP selfie shooter. The Android 5.1 Lollipop OS also keeps the Huawei GR5 a breeze to use.